“When do I stop doing research and start writing?” That question plagues writers of historical fiction. When you are working on a Ph.D. professors often answer that question this way, “When you pick up a book on your topic and you are familiar with most of the books listed in the bibliography, quit!” I use another rule, one I learned in a roundabout way from Eudora Welty. Ms. Welty (pronounced “Miz” in “Southern”) was one of the many graces of attending Millsaps College. As Writer-in-Residence she attended a seminar I was taking in my junior year. I was awed, meeting a woman who earned a living as a writer and, I was as charmed as a young woman could be when visiting an eccentric maiden aunt. It is important to understand that a next-door neighbor in the South is a person who knows you extremely well. Unlike in many parts of this country where I have lived, your next-door neighbor walks into your house with a holler rather than a knock, is the first person to bring a casserole when you are in need, taught you how to cook collard greens, and told you where to get a bargain on those new pillows on your couch. 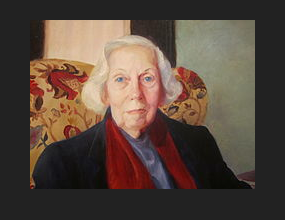 So, using the Southern definition of neighbor, I think Eudora Welty would say that you stop doing research on a historical novel and start writing when you know as much as your heroine’s next-door neighbor would have known.